Sometimes wearing black, white, and red seems like a cop out. It's just so easy and possibly a bit predictable, but it is an undeniably powerful color combination. It packs a ton of contrast, which in turn, is extraordinarily eye-catching. This is one of the main reasons why the color triumvirate was championed by the Russian Constructivists, a post-World War I art movement. 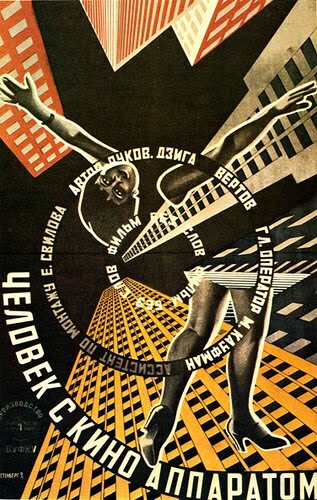 Active from around 1919-1934, Russian Constructivism purported the use of art for social means, including propaganda and promotion of technology. 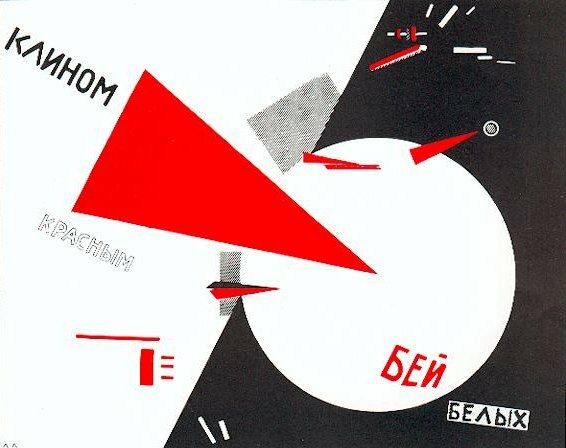 Beat the Whites with the Red Wedge, by El Lissitzky, is one of the most well-known Constructivist posters. 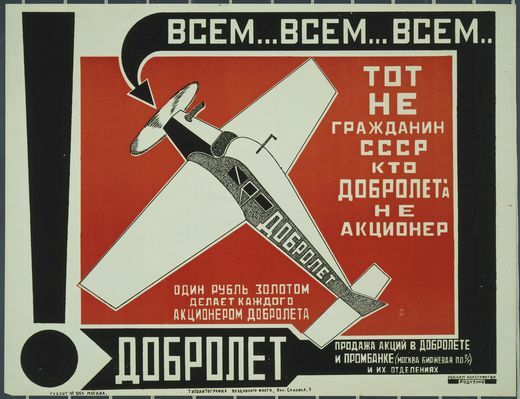 Aleksandr Rodchenko's Constructivist posters were also central to the movement. The Constructivist architect Vladimir Tatlin was lauded for his model of the Monument to the Third International. Intended to be erected in what is now St. Petersburg after the Bolshevik Revolution, Tatlin's Tower was never actually built. However, it became a symbol of the Constructivist aesthetic and championing of the technological machine age. Above is a film poster by the Steinbergs. Constructivism owed much to the Suprematism of artists like Kasimir Malevich. The influence of Constructivism is still apparent today, especially in street art (think Shepard Fairey). For my Constructivist look, I paired an El Lissitzky-esque sweater with lots of black and a pop of red, and shot the photos at the base of an electrical tower reminiscent of the Monument to the Third International. I'm wearing a vintage leather jacket, vintage sweater, H&M skirt, DKNY tights, and L.A.M.B. wedges. Your whole outfit, these photos, amazing. Are you a model? Another great ensemble, Ariel. Wonderfully imaginative post and great setting, with the stark concrete light tower puncturing the air. Your beautiful red jacket, lips and nails against your black and white sweater beautifully echo these posters. Your hair looks brilliant in every photo. Thanks for sharing!! I love the black, white and red colour combination. It's really easy to put together and looks great. The red also adds a great pop of colour to the whole look. I really love your jacket. Black white and red are always very striking. I love the outfit, especially the pattern on the sweater! I am really in love with your style!! This is such a great and unique blog!! And thanks for following me dear..
You look incredible! I especially love that sweater that you're wearing and the shape of the red jacket is fabulous, very 80s. Did you ever see the Modernism: Designing a New World exhibit at the Corcoran in DC few years back? It's one of my favorites. 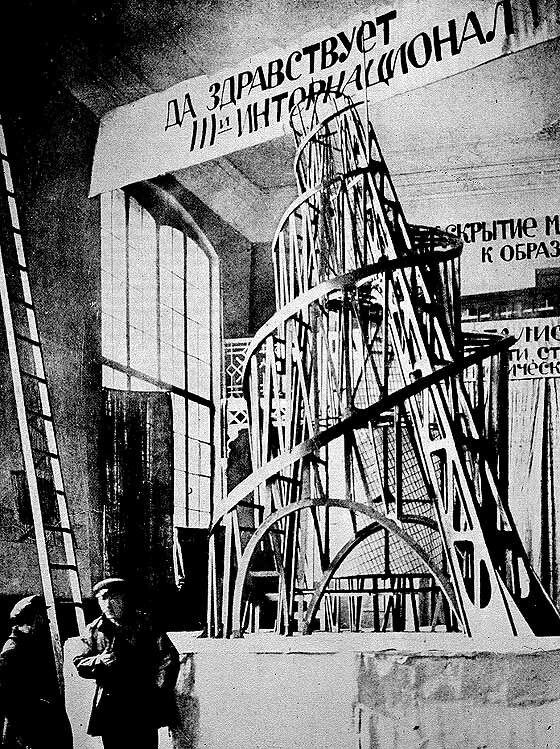 There was a model of Tatlin's Monument to the 3rd International in the middle of one room. Quite impressive. Great job capturing the spirit of constructivism with the outfit and backdrop. Great outfit. Love that red jacket, the shoes and the red lip. I agree that wearing black, white and red is kinda easy...the hard part is how to wear it without it being boring and you've certainly achieved that! oooh love your jacket & sweater! cant get over how cool your blog is, really :] thanks for the sweet comment you left on our blog! its much appreciated <3 we'll be back to visit you again soon! Even though black and white with a pop of color is easy, it's one of my favorite combinations. I usually dress in muted colors (most typically, black) and punch it up with different color accents to keep it from being boring. This is probably one of my favorite outfits of yours! your outfit has the perfect constructivist inflence to it. I love the punch the red packs, so striking against black and white. loving your blog still; always an inspiration! You look lovely in these photos! That red leather jacket is gorgeous. I really like those wonderful shoes. Very lovely! I like how I even got a history lesson from this. <3 Your style is gorgeous! I like the area where you had the shoot too. The red jacket made the outfit "pop"! Amazing! I love that peplum jacket! I know what you mean about the predictability of red white and black, but the combo is too perfect to ignore, and is never boring. You look so fabulous in black white and red!!!! I totally love the geometric-ness of the posters you featured. beautiful shoes! and love the red jacket! You are truly creative. Love the sweater and the shorts. And then you added that jacket which looks amazing. Your jacket is phenomenal. If I could find a red leather jacket, my collection would be complete! Black, white, and red are my favorite wardrobe colors. It took a long time for me to accept that since my high school colors were black and red--and except for my cheerleading uniform, I never wore them. (One can have too much school spirit!) It may be clichéd, but the combination is never boring. It's simple, too. And I love simple. I like your style.. that vintage black and white sweater's insane!.. reminds me of Ferris Bueller... stay cool! This is another one of my favorites Relic! I was so shocked to see you in just B&W, but I knew there was a pop of color coming! Thanks for taking the time to comment on my blog. I will be following you. Heard that a storm is heading to New York. Hope it will not be too bad. absolutely gorgeous outfit! your wedges are to die for! You look so great in that black and white sweater. I loving this outfit. That jacket is gorgeous and the shoes tie the whole thing together. I love how you pulled the art work into it. You are quite awesome and it was tress cool to be reminded of the Russian constructivist movement's color triumvirate. =) Gorgeous with brains. Excellent outfit. Also, I started the I6L motion! I need help choosing, however, among three of the six items or less to be worn for a month. absolutely stunning- i love constructivism and you have captured it beautifully, as you do all styles. That sweater you are wearing is wonderful! again great ideas and looks! Wow!! This photos are amazing!! Georgerous!! Oh I love the angles you channeled in this look! You just reminded me of when Shepard Fairey did Russian Constructivist-style artwork for Saks a couple years ago (say wha?). Your rendition makes much more sense than his did. love love love the red jacket ! Love this look, and I found it very intriguing to see just how powerful those colors are and how they've been used. It may be predictable, but something in the mind is drawn to them because it draws the eye in such a startling way.